The Dallas Stars announced the roster for the Traverse City NHL prospects tournament today. The squad includes several current Texas Stars and several more expected to be on the team this coming season. Here's the list, as summarized by Mark Stepneski. 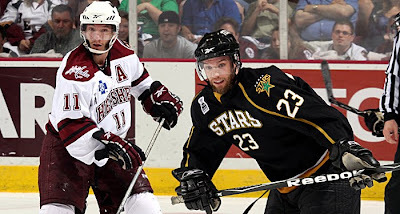 I've put potential 2011-12 Texas Stars in bold face. As expected, the team will be coached by Jeff Pyle and Jeff Truitt of the Texas Stars. The tournament runs from September 10th to 14th. This brings up the big question of who we will see in Cedar Park next season. Over the next week, I will be previewing the lineups I believe to be most likely based on all of the current (and some still expected) signings. Stay tuned for that starting on Monday. As mentioned before, there has been a lot of ink spilled on the topic of the AHL schedule matrix and how unbalanced it is. Instead of piling on to that argument today, I wanted to take a look at the other side of the coin, which was shown to me first by "GM" at the Hershey Bears Hockey blog. In his post last week "Defending the Schedule Matrix and an Early Look at a Potential Lineup", GM made a lot of good points about why the schedule matrix is the way it is. The foremost of them all is money, and not in a greedy "NFL owners" way but more in a "if we don't make any, we're going to have to shutdown the team" way. The crux of the argument is that most of the money for AHL team operations comes not from merchandising or TV and radio deals, but instead from the ticket sales. Despite the devotion of many who read this blog to every movement of the team, there are an equal, if not greater, number of people in Austin who just want to watch good hockey and don't care that Sean Backman got scratched tonight in favor of Michael Neal. These are the folks that help get the building to 6,863 on those rocking nights at the CPC. HBH's argument is as follows: On paper, which matchup is the casual fan likely to be more interested in: San Antonio or Binghamton? With no offense to the Eastern Conference, the fanbase in Texas is more likely to have an emotional connection to San Antonio, Houston or even Oklahoma City. Wilkes-Barre, separated from Hershey by just 2 hours of highway, is the top drawing matchup by almost 3,000 fans. "One Saturday, [Albany] played Adirondack and drew 5,200 fans (2,000 more than their season average). The next Saturday they played Norfolk and drew 2,200. That is 3,000 fans less, and that makes a huge difference on revenues." Looking at the data though, the Stars ticket staff seems to do a fine job selling any matchup. This is the data for average attendance for home games against opponents Texas played three or more times. I don't deny there are inefficiencies in the data, such as Peoria playing all their games early in the season and Milwaukee playing all theirs on Fridays and Saturdays. However, it doesn't seem like the trend holds true for Texas. Casual fans show up when the opposition is a known rival. Simple as that. And the AHL is built and survives based on the interests of the CASUAL FAN. Without them there would be many fewer teams which would affect the overall hockey landscape as a whole. So, in the end I would love to see more competitive balance (and honestly without tearing apart every single teams matchups I can't honestly say there isn't SOME balance worked in) I also understand that in order to maintain a successful league and successful teams you have to get people in the seats. And the best way to do that is to schedule the rivalry teams more than any other. What do you think? Does this argument make sense for the Stars, given the shown data? And even if it doesn't, does it matter, given that it makes sense for other teams? In addition to announcing the Dallas Stars signing of Ray Sawada today, the Texas Stars announced the signing of right winger Nick Layton to an AHL standard player contract. Layton's name might be familiar to those who closely followed the Allen Americans' playoff run, as he scored 7 goals and added 10 assists in 20 games for the Bossier-Shreveport Mudbugs. The Mudbugs defeated the Americans en route to the Ray Miron Cup as CHL champions last season. Layton has played in the QMJHL and for the University of New Brunswick. In my estimation, with the current logjam at forward in Texas, the Stars will be sending Layton for development in Boise or Allen. Given his history in the CHL, Allen would make more sense for the young winger. The Stars are surely looking to add more AHL only players but are definitely running short on roster spots with quality Dallas-signed skaters joining the club. I will be running down the entire roster, as I see it, more in the next week or so. For now, I would keep an eye out for a signing by Cody Chupp, who was a quality contributor to the team last season, and Stephen Schultz, who joined the team on an ATO and scored an invite to Stars Development Camp in Dallas. I would not expect Mike Embach, the remaining post-season ATO, to return to the club this season. He was a healthy scratch most nights and did not make an impact when on the ice. The Dallas Stars announced today that they have re-signed winger Ray Sawada to a one-year, two-way deal. Free agent signings have slowed down in the last few days as the availablity of both players and roster spots has dwindled. Sawada will likely be with Texas unless he can break through onto the Dallas roster, which may be difficult given the talent at that level. However, as the release below notes, Sawada had career highs in goals, assists and point this past season. The Dallas Stars announced today that the club has agreed to terms with forward Raymond Sawada on a one-year, two-way contract. Sawada, 26, who appeared in one NHL game last season with Dallas, missed nine games during the 2010-11 season from Feb. 5 – Feb. 24 with a shoulder injury suffered against the Boston Bruins on Feb. 3. Texas wasted little time after hiring Jeff Pyle before bringing on a new assistant and completing the Stars' coaching staff. 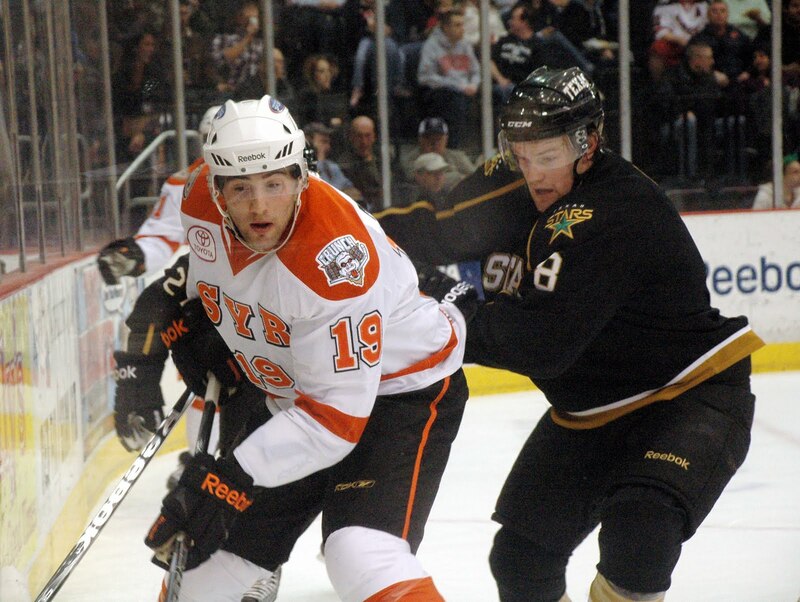 Jeff Truitt comes to the Stars from the San Antonio Rampage, where he spent one year under Ray Edwards. When the team relocated to Portland, Truitt decided to stay behind and pursue other opportunities. Truitt has most of his experience in the WHL with the Kelowna Rockets, winning a championship with the club in 2005 in his first year as head coach. In three seasons with Truitt as the head coach, the Rockets posted a 113-76-18-9 mark with two postseason appearances. He was an assistant on the club from 2000-2004. The club also had success with Truitt in the assistant role with a championship in 2003 and 2004 and a Memorial Cup win in 2004. He moved to the Springfield Falcons in 2007 as an assistant and was promoted to head coach in 2008 but was replaced midyear. 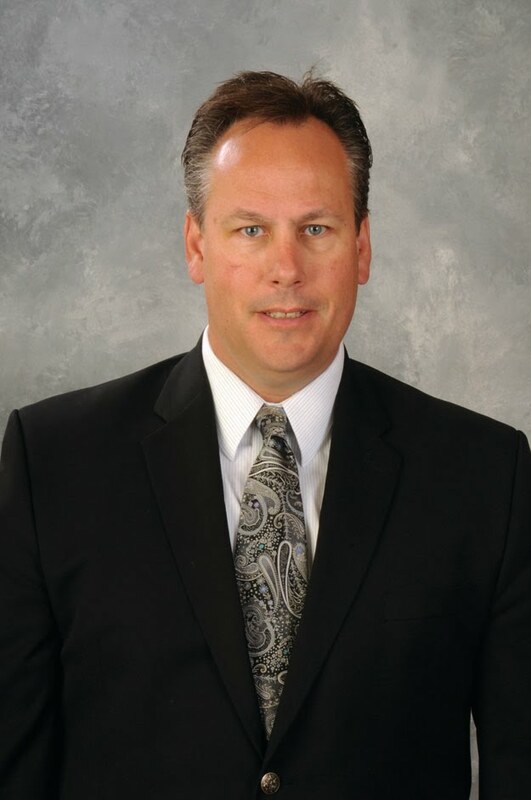 He spent the 2009-10 year as Director of Hockey Operations for the Moose Jaw Warriors of the WHL. Coach Truitt is not expected to join Coach Pyle for the Meet the Fans event on Wednesday. 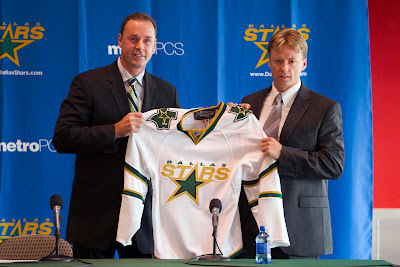 Two years to the date that GM Scott White introduced Coach Glen Gulutzan to the media, White took to the microphone again to welcome Jeff Pyle to the Texas Stars head coaching position. Coach Pyle came across as being genuinely excited to be in Cedar Park and anxious to get started with the team. White spoke first about the process of hiring Coach Pyle. The team started the process a few days before the official announcement for Gulutzan in Dallas on June 17th. The initial list of 30 potential candidates was whittled down to five viable candidates. How Pyle came to be a part of that list is quite an accident. With the Stars signing Ryan Garbutt, who played for Pyle in Gwinnett, White and Pyle were in touch on Ryan's skills and capabilities. As a friend, Pyle sent his resume to White for a critique because he was considering applying for other jobs outside Gwinnett. White liked what he saw so much that he added it to the list. According to White, Stars GM Nieuwendyk and Les Jackson "kept coming back to Jeff" in the list. Unexpectedly, Pyle was asked for an in-person interview in Dallas. He was on vacation in California with his wife and two children. Pyle, who has "racked up the airmiles" in the last few weeks according to White, had to go out and buy a quick, cheap suit and get on a plane to DFW for the July 2nd interview. After an "emotional rollercoaster" of waiting, Nieuwendyk got back to Pyle on Tuesday morning. "Nieuwendyk called me and said 'I told you I was going to get back to you. And, you know, you're a great guy, your interview went well, and everybody liked you.' And I was waiting for that "but", but it never came." After twelve years in Gwinnett, Pyle focused on the fact that any move he made needed to really be a good situation for him as a coach and for his family. With the Stars and Cedar Park, he feels like he has found that. "I was overwhelmingly impressed with the organization: how committed they are to each other and how much they have each other's backs," said Pyle. "Most coaches wish they were in that sort of situation." Another item that is often forgotten is the ECHL's dual GM/coaching role. All ECHL head coaches also do the GM role, which includes recruiting new players, hotels, apartments, travel and all of the administrative tasks for the team. Coach Pyle is excited about focusing on his coaching role 100% in Cedar Park. "If we could start tomorrow, it wouldn't be soon enough." GM Scott White expects an announcement on an assistant coach on Monday or Tuesday at the latest. There will only be one assistant coach again for the Stars. Coach Pyle will be the coach of the Stars' team at the Traverse City Tournament. Coach Pyle will coach his first regular season game for the Stars on his 53rd birthday: October 7th, 2011. The Texas Stars announced their "schedule matrix" for 2011-12 last night. Due to often playing second-fiddle to NBA in many cities, the AHL is later than most of the hockey leagues to release their schedule. In mid-July each year though, each team releases a list of their expected opponents and how many times they will play each of them. The schedule is better than last year but still unbalanced due to travel concerns. The Stars will play their new West Division opponents the most, a total of 38 of 76 games or half the schedule. All teams play an equal number of home and road games against each other. Houston and San Antonio will make up the lionshare of that with 12 games each, 6 at home and 6 on the road. The OKC Barons are next in line with 10 total games, and Abbotsford rounds out the schedule with 4. The Heat and Stars will play no more games against each other this season than either of the last two, despite now being in the same division. The Midwest Division is the next most populated on the Stars' schedule. Texas will play four games against Chicago, Peoria, Milwaukee, Rockford and Charlotte. Charlotte is the only newcomer to the schedule in this division and this year will mark the first games between Texas and the Checkers. Finally, the schedule is rounded out by the North Division. Texas gets Grand Rapids and Lake Erie four times and Hamilton, Toronto, and Rochester two times. Rochester will also be a newcomer to the Stars' schedule this season, marking the first time Texas has played the second-oldest team in the AHL. Two games against each Western Conference opponent is the high point of this schedule format. Not playing any games against Rochester in the past two years was a clear fault in the system that has been rectified. However, zero games against any Eastern Conference opponents is the low point. Texas misses out on seeing half of the league's up and coming talent in this current format. When it comes to selecting All-Stars and end of the year awards, how will East Coast reporters know which Texas players should be on their ballots other than by stats sheets? It's a flawed system, but it's one that will not be easily fixed. Travel costs are the main concern for most of these teams. Based on history, look for the full schedule to be released toward the end of August. 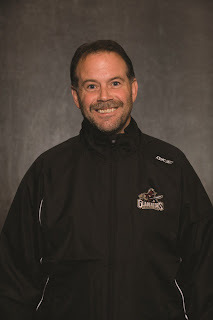 The Texas Stars announced today that they have hired Jeff Pyle of the Gwinnett Gladiators to be the next head coach of the franchise. Pyle comes to Texas with twelve years of head coaching experience at the ECHL level in the Atlanta Thrashers organization with both Mobile and Gwinnett. Pyle made the playoffs in six of his eight years in Gwinnett, including a trip to the ECHL Finals in 2006. He is 3rd all-time in the ECHL in regular season wins, seasons coached, games coached, and playoff appearances. His Gladiators are well-known for their special teams prowess, setting the ECHL record for PP goals scored in 06-07 with 120. Pyle played professionally for 13 years as well between North America and Germany, amassing 1,313 points in 795 games and winning four league titles. "[Coach Pyle's] a smart hockey guy, and he's deserving of this opportunity," said GM Scott White, who coached the Columbia Inferno against Pyle in the ECHL. Pyle was selected from a short list of five who received in-person interviews with the team. The field ran the gamut from NHL and AHL assistants to ECHL coaches as well. White indicated that Joe Nieuwendyk and Les Jackson really took a liking to Pyle because he has a lot of "Dallas Stars attributes" including passion, energy and knowledge about the game. That synergy with Dallas is seen as a huge plus for the new hire. "We're going to play the game that the Dallas Stars play," said White. "[Until now], we haven't had that vertical system and I believe that's going to benefit our players here"
Coach Pyle is currently vacationing with his wife and two children in California but was available by phone. Asked to describe his team's style of play, Pyle indicated that an up-tempo style would be showcased on the ice next season: "I like to be up-tempo. I like when the game opens up and we can be creative. When we have a chance to do the little things well and you can be offensive, I want them to go." Part of that bigger offense is a power play unit that set records in the ECHL. Pyle said his power play is aggressive and won't sit back when there is a chance to be aggressive with the puck with the man advantage. That should help a Stars power play unit that finished 20th overall in the AHL. A staple of Texas Stars hockey in their two years in the league has been defensive responsibility, and Coach Pyle intends to continue that style. "I want them to be as proud to stop a goal as they are to score one." Another big adjective describing Pyle was accountability. Recent Stars signing Ryan Garbutt, who played ten games for Pyle in Gwinnett before his callup to Chicago last season, said Pyle is a true player's coach. "He holds you accountable for winning. He instills success in his players. He pushes his players up to the next level and to be better all the time." On the subject of accountability, I asked Pyle about his team last year, which started strong with eight wins in ten games, but ultimately missed the playoffs. That club lost a total of sixteen callups to the AHL last year. Additionally, injuries to eight different players led to 277 man-games lost to injury on the season. Coach Pyle, who could have easily made excuses for the playoff miss, holds himself accountable, just as he expects of his players. "We had a lot of little things that we battled through," said Pyle. "My job is to find a way to win no matter if you're shorthanded or what happens." He hopes to instill that accountability in the Texas Stars as well this season. With coaches Gulutzan and Jerrard hired in Dallas, the draft completed and development camp over, the Texas Stars have turned their focus to their head coaching vacancy. According to sources, the field of candidates has been reduced to no more than three. It has been confirmed that the field includes former Chicago Blackhawks head coach Trent Yawney, as first reported by the Dallas Morning News. The Stars are currently working to select their top choice for the job, and it is believed an offer to the leading candidate is forthcoming sometime this week with an announcement to follow. At worst, the position could be finalized sometime next week. Once the head coaching job is filled, Texas will need an assistant coach to fill the vacancy left by Paul Jerrard. The field of candidates for assistant coaches will assuredly be larger, as there will be more candidates qualified for the assistant than head coaching job. Additionally, Texas’s new head coach could bring one of “his guys” to the table for the assistant job. The hockey world doesn't take time out to enjoy Canada Day and the Fourth of July with July 1 being the start of free agency. Let's take some time today to catch up on what you might have missed over the weekend. By far the biggest story of the weekend was announced yesterday, the realignment of the AHL into six 5-team divisions. With thirty teams, four divisions were no longer enough to properly setup the playoff race. Texas will now play in the West Division with Oklahoma City, Houston, San Antonio and Abbotsford. Playoff seeding will be performed just like the NHL, with the top three seeds going to division winners and the next five being seeded by their total points. For full divisional alignment, check out TheAHL.com's story on the matter. If you look at the West Division around the February to March time frame, you'll see a perfect example why this change was needed. Anyone of the teams in the eight-team West Division with the exception of last place Rockford would have made the playoffs in the North Division for much of those months. However, two of the West Division teams would have been left out in the cold despite having better records than North Division playoff clubs. This is a good change for the AHL at first glance. When the schedule breakdown is released in the next few weeks, we will get more clarity on how much balance the new alignment will bring to the league. If Texas yet again does not play Rochester, a team in its own conference, and other such travesties, the realignment will have failed. Free agency was this weekend and several Texas Stars were signed away. Among those leaving the fold were Aaron Gagnon and Greg Rallo. Gagnon signed a two-year deal with Winnipeg, the second year of which is one-way. Rallo signed a two-way deal with the Florida Panthers and will likely be playing for the Rampage. The Dallas Morning News reports that the Stars are done in free agency, which likely leaves Texas Stars Trevor Ludwig, Raymond Sawada and Brent Krahn looking for jobs elsewhere. Dallas signed Jordie Benn and Ryan Garbutt to two-way deals this weekend. Jordie Benn has now worked his way up from the ECHL and CHL to an NHL deal. Ryan Garbutt is a nice addition for Texas as well. Garbutt scored 37 points for Chicago and led one of the worst clubs in the division in plus/minus in his rookie year. With the signings of Adam Pardy and Sheldon Souray in Dallas, the NHL club has seven big league defenseman on their roster (Robidas-Goligoski, Souray-Grossman, Pardy-Daley, Fistric). This means that Philip Larsen will likely start the year in Cedar Park.